The flower industry has picked up business over the past few years. This is primarily due to the big demand for these sweet smelling blossoms for wedding events and functions. Indian weddings are known throughout the world for their extravaganza. This coming together of two families is celebrated with plenty of celebrations and aplomb. Every aspect of an Indian wedding starting from selecting the venue, to the wedding outfits, the traditions are given a lot of thought. Flowers form a very integral part of Indian weddings. They add a charm to the entire wedding that cannot be matched. So no matter where you are getting married, a wedding is incomplete without the slight hint of the sweet fragrance from these beautiful floral decorations. Indian weddings are usually on the bigger scale with plenty of family and out of town guests coming together to give their blessings to the new couple. You can ensure that your guests and family have the time of their lives by dressing up your wedding venue with gorgeous floral decorations that will surely take their breath away. Wedding Stage decoration with flowers is an art that needs to be left to the professionals for a spectacular outcome. 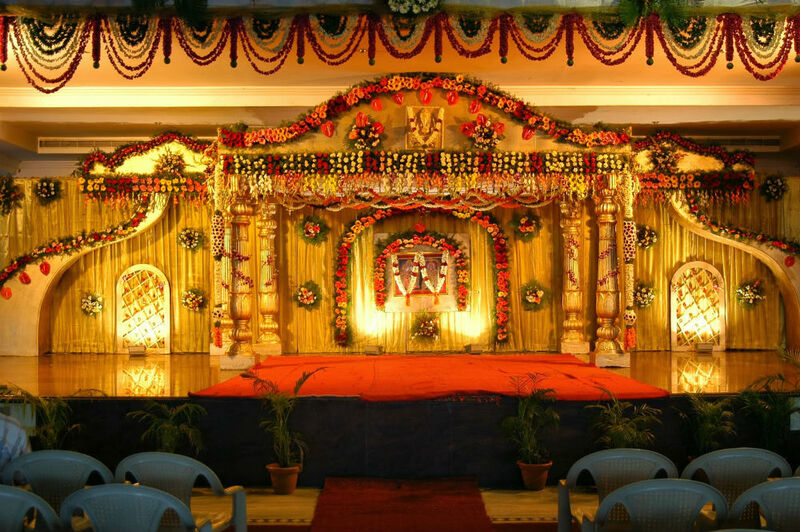 Stage decorations incur a lot of floral usage even though various trends of using different décor items like hanging mirror curtains etc. have risen recently. Floral decoration on the stage consists of different coloured flowers intertwined onto a metal layout. Each metal layout has different shapes, giving you a different look once the flowers are added on to it. The flower arch is the most popular one, with most couples preferring to get married under a cloud of beautiful and fragrant flowers. Another creative way to add flowers to your wedding stage is by setting up different flower planters and vases filled with long stemmed flowers. This adds an ethereal feel and will turn your wedding into a heavenly union in all senses of the word. Indian weddings are incomplete with the intoxicating jasmine flowers. These petite white flowers are inconspicuous in size but have the potent to knock over anyone with their sweet fragrance. If you plan of having an open air wedding, these pretty white flowers will stay fresh longer and keep the wedding venue looking pretty and smelling heavenly at the same time. Did you dream about walking down a path of red roses as you get ready to say I do to the person of your dreams? Well, despair not! 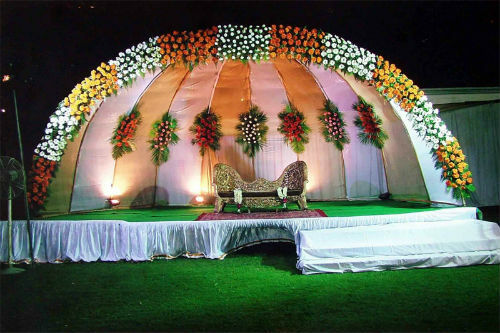 This can be turned into reality by the best wedding decorators in Chennai by arranging rose petals to be laid out across the stage, making your wedding truly a dream wedding. Modern day couples are incorporating the traditional Indian weddings with a modern twist by changing up the venue décor. Even though the yellow marigolds might not make an appearance, flowers are still an important additive to the wedding in the form of small bunches of roses shaped into tiny balls that are hung from the ceiling. Another way of changing up the traditional Indian wedding scene is by having plenty of antique pieces set around the venue along with freshly cut flowers for a touch of elegance.